Small Pockets of Meadow-Style Planting in the Garden Designed By Tom Stuart-Smith at Broughton Grange, Oxfordshire. Ammi majus, Viscaria oculata and Papver rhoeas. Image: Chris Denning/Verve Garden Design. 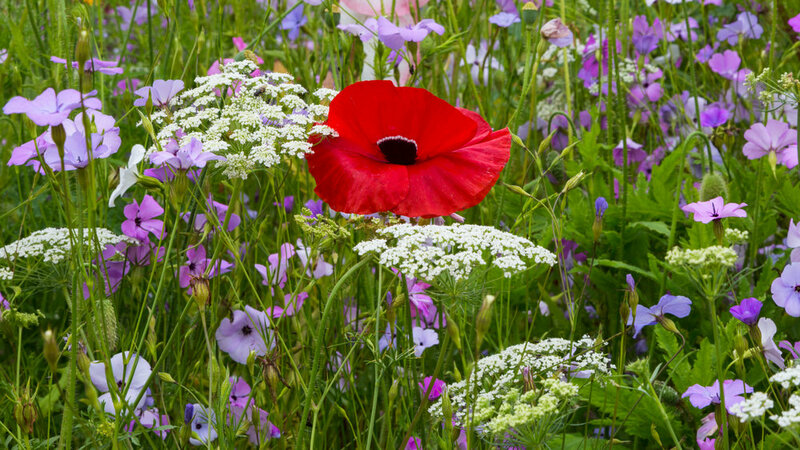 Although natural wild-flower meadows are sadly becoming more scarce, forward-thinking garden owners are using their skills to recreate the feeling of summer picnic heaven in their own spaces. Read below for seven of the absolute best that England has to offer. Car packed with hamper and rug yet? (oh and don't forget the kids!). Pictorial Meadow Seed Mix by Nigel Dunnett at Trentham Gardens including Queen Anne's Lace (Ammi majus), Blue Cornflower (Centaurea cyanus), Scarlet Red Flax (Linum grandiflorum), Yellow Coreopsis tinctoria and Pink Cosmos bipinnatus. Image: Chris Denning/ Verve Garden Design. If you needed convincing of the real pleasure we get when around colourful flowery meadows, you only need to ask visitors to the Trentham Estate between Spring and Autumn. When the 2 mile walk around the stunning, 'Capability' Brown lake was becoming overgrown and underused, Trentham took the bold decision to thin out many of the old trees and begin a multi-year programme of adding meadow-like planting patches. Fortunately, help was nearby. 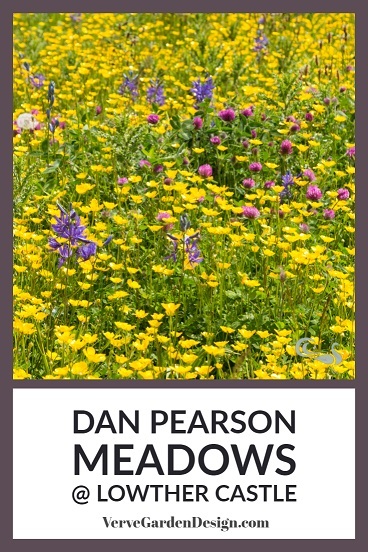 Professor Nigel Dunnett has spent years at the University of Sheffield researching how to create a long-lasting meadow feel with wow factor. Using his expertise in how to combine mixes of plants to give ever-changing colours over many months, Professor Dunnett akins his style to painting with plants to give a natural effect- hence the term "Pictorial Meadows". Pickle, the Verve Garden Design Border Terrier, amongst the Midsummer Pictorial Meadows at Trentham Gardens. Image: Chris Denning/ Verve Garden Design. So do they work? You bet! Garden Manager, Michael Walker, now sees many more people, young and old alike, spending time around the lake. The meadows are a complete visual feast, as well as a kids play area, picnic spot and place for four-legged friends to enjoy. You can see Team Verve's very own Pickle gives Trentham's meadows his seal of approval. The areas are so large that there always quiet spots, especially since the gardens are open to enjoy until late into summer evenings. Our verdict? -Unmissable and a great family day out. Buttercups (Ranunculus) and alliums as far as they eye can see in the meadow at Cothay Manor. Image: Chris DenningVerve Garden Design. For those who prefer their meadows with some more native species than those at Trentham (or those like Team Verve who love them all), Cothay Manor is magical. The simple, mown paths give all the structure that is needed to link the sea of flowers to the 15th Century Manor House house. The meadows were not part of the 1920's garden rooms created in the same fashion as Hidcote and Sissinghurst, but instead were reclaimed from the parkland. The current owners, the Robb family, used the spoil from building the little lake to make the mound of earth overlooking the meadows. When we visited this was the domain of a very handsome metal stag perusing his buttercup-yellow home. It was also an amazingly quiet spot to soak in the gently wafting grasses and breathe in the pure, simple joy of the place. We had the entire meadow to ourselves and enjoyed the selfish pleasure for a while. Mrs Robb describes the North Meadow here as "fairyland"*. We know exactly what she means. A few remnants of the earlier bulb-fest in the form of some alliums were still evident, and we would love to return in Spring to see the tulips and camassias. The North Meadow With Mown Paths and buttercups at Cothay Manor. Image: Chris Denning/ Verve Garden Design. Meadow as far as the eye can see at Cothay Manor. Image: Chris Denning/ Verve Garden Design. Wildflower Meadow With Yarrow (Achillea millefolium) and Meadow Cranesbill (Geranium pratense) below Haddon Hall in Derbyshire. Image: Chris Denning/Verve Garden Design. Like Cothay, Haddon Hall provides another timeless medieval backdrop to these wonderful Derbyshire meadows. Set in the damp, limestone surrounds of the River Wye, Haddon has a lot to offer meadow-lovers. Between the car park and the Hall entrance are fields full of yarrow (Achillea millefolium), meadow cranesbill (Geranium pratense) and grasses that create sinuous waves in the breeze. The flat white (we also saw some pink) tops of the wild yarrow together with the soft, ferny foliage make this a special plant. Apparently named after Achilles, who legend has it used the herb to seal battlefield wounds, the Geranium has also been used to stop nosebleeds, wounds and even cholera. Ox-eye daisies (Leucanthemum vulgare) and Beech (Fagus sylvatica) topiary giving the Arne Maynard-designed borders a meadow-like feel at Haddon Hall. Image: Chris Denning/Verve Garden Design. Inside the formal gardens, the meadow theme has been continued in the loose, romantic planting style envisaged by renowned designer, Arne Maynard. In July, there are borders full of oxe-eye daisies (Leucanthemum vulgare) and the orangey-red flowers of sorrel (Rumex acetosa) intermingled with loosley-clipped beech domes and roses on the Fountain Terrace. Even Maynard's interpretation of a knot garden on the Bowling Green Terrace has a meadow-like quality, with the billowy Germander (Teucrium), Lavender and Rosemary 'Mrs Jessop's Upright' defining the segments rather than the more usual clipped box (Buxus). Used for the filming of Jane Eyre, we're not sure there is a more romantic garden in which to get the meadow bug. Even the knot garden has a meadow-like feel in the Arne Maynard garden at Haddon Hall. Image: Lorraine Young/Verve Garden Design. Wild Carrot (Daucus carota) giving the meadows an ethereal feel at Brightwater Gardens in Lincolnshire in late summer. Image: Chris Denning/Verve Garden Design. In complete contrast to the historic settings of the gardens above, these meadows in Saxby, a tiny hamlet in rural Lincolnshire, surround the cottage home of Chris Neave and Jonathan Cartwright. Chris and Jonathan have been developing the gardens since 1999 and they now run to 8 acres. Deservedly, their incredible feat of mainly DIY design, landscaping, cultivating and planting has been recognised by RHS Partner Garden status- a rare accolade for a very new garden. Extending from the formal series of spectacular garden rooms are wildflower meadows that link the site to the surrounding farmland landscape. 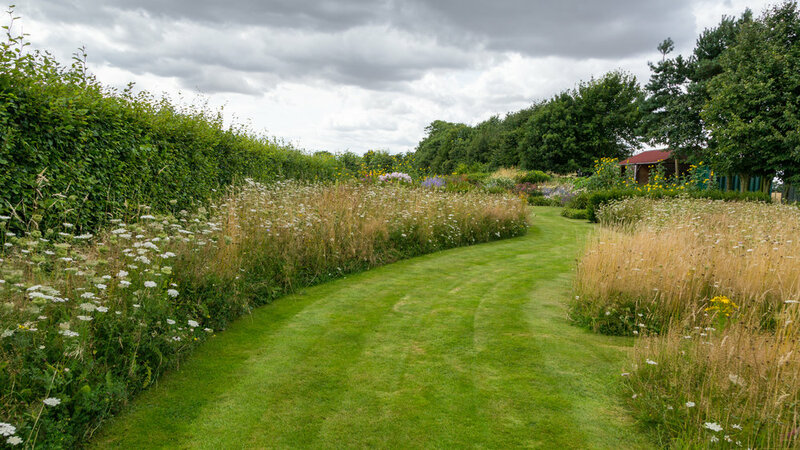 In addition, there are lovely curvaceous swathes of garden-style annual meadows leading to the stunning prairie-style beds that take centre stage from late summer onwards. Filled with colourful ox-eye daisies, cornflowers and corn poppies (Papaver rhoeas) in summer, nectar-rich Wild Carrot (Daucus carota) dominated the blissful scene when we visited in September. There's lots of space to have to yourself and the resident collie gives everyone the friendliest of welcomes. Well worth a trip, we think. Annual, meadow-like swathes lead you into the colourful Prairie Borders at Brightwater Gardens. Image: Chris Denning/Verve Garden Design. Detail of the Camassia, Red Clover and Meadow Buttercup meadow areas designed by Dan Pearson at Lowther Castle. Image: Chris Denning/Verve Garden Design. We love Lowther Castle as an example of how to restore an overgrown, ruined historic site and turn it's grounds into a thoroughly modern space that future generations of all ages will spend happy days in. With a masterplan for the site created by Dan Pearson, you know it will have been designed with soul. Towards the castle, on either side of the truly vast South Lawns, Pearson has responded to the wild and overgrown feel of the castle with large meadow areas. We saw kids drawn to these like a magnet and they are quite wondrous. Like at Trentham Gardens, no-one was keeping toddlers or their doggy friends away from them and it was inspiring to see a historic estate genuinely making a real place for everyone to enjoy. When we visited in late May, the buttercup-strewn meadows were dotted with blue Camassia leichtlinii spires with drifts of Red Clover (Trifolim pratense) peaking through. Remarkably, 28,000 Camassia bulbs were planted by volunteers during Autumn half-term in 2017. What a fabulous way to give local communities. ownership of their heritage. The meadow extravaganza continues into the secluded area surrounding the restored Countess Summerhouse where dandelion "clocks" (Taraxacum officinalis seedheads) and Red Campion (Silene dioica) flowers preside. Even the newly-planted Orchard, with 167 carefully-selected plum, apple, pear, damson and hazel trees have had squares of unmown grass left to form meadow in a very satisfying nature-nurture combination. It's all buzz at Lowther Castle! Vast Areas of Meadow-Style Planting by Designer Dan Pearson at Lowther Castle. Image: Chris Denning/Verve Garden Design. Squares of Unmown Meadow in the Orchard at Lowther Castle. Image: Chris Denning/Verve Garden Design. Red Campion and Dandelion Clocks in the Countess Summerhouse, Lowther Castle. Image: Chris Denning/Verve Garden Design. Red Annual Poppies Making a Splash at RHS Wisley. Image: Chris Denning/Verve Garden Design. At the RHS Headquarters garden, the team are always innovating and adding pop-up pockets of annual-meadow style colour and diversity. The great thing about the RHS Gardens, aside from immersing yourself in some of the best planting around, is that you are surrounded by very friendly expert gardeners, all delighted to help you with ideas of how you can take ideas home to your own garden. Over the years we have seen some amazing meadowy-wonders at Wisley, so it was a hard job to choose a few to showcase here. One of our favourites has to be the red poppies under the pear trees in the Vegetable Garden-they stopped everyone in their tracks. Another technicolour feast we loved combined various poppies (Papaver), orange California poppies (Eschscholzia californica) and a mix of colourful cornflowers (Centaurea cyanus). The seed mix used to create this effect was another developed by Nigel Dunnett, as described earlier for Trentham Gardens. 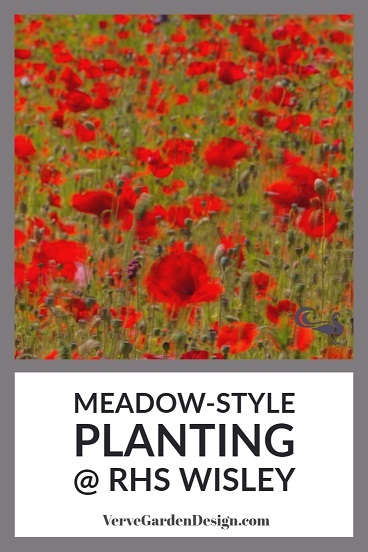 Luckily for us, we can now all buy small packets of various similar seed mixes to experiment with in our own sunny garden areas from PictorialMeadows.co.uk. Give it a go, plan for next year and sow your little patch of meadow joy in April! Poppies and Pear Trees in the RHS Wisley Vegetable Garden. Image: Chris Denning/Verve Garden Design. Ragged Robin (Lychnis flos-cuculi) and Buttercups in the RHS Rosemoor Wildflower Meadow. Image: Chris Denning/Verve Garden Design. Between the formal gardens and the Fruit and Vegetable Garden at Rosemoor, the RHS have carefully established and nurtured a dreamy large area of native wildflower meadow. It is a wonderful place for a sunny, slow picnic and to soak up some peace and quiet. Starting with yellow rattle (Rhinanthus minor) to weaken the grass growth and allow wildflowers to populate the area, careful management has filled the area with Meadow Buttercup (Ranunculus acris), Betony (Stachys officinalis) purple Self-Heal Prunella vulgaris, Common Knapweed (Centaurea nigra), Ragged Robin (Lychnis flos-cuculi) and Ox-eye daisy (Leucanthemum vulgare) to keep the meadow in flower throughout the summer. Although this looks very natural, it has taken a lot of horticultural skill to establish this effect. Those guys at the RHS sure do know what they are doing! All of the flowers been used as medicinal plants and all are nectar rich and loved by pollinators. It's a lovely thing to share it with them for a while. Betony (Stachys officinalis) and Buttercups in the RHS Rosemmor Wildflower Meadow. Image: Chris Denning/Verve Garden Design. Above- Natural Wildflower Meadows at Cothay Manor. Below- Meadow-Style Planting at Trentham Gardens. Designer: Nigel Dunnett. Images: Chris Denning/Verve Garden Design. Is their a stunning garden meadow near you ?- Please do share with us in the Comments Below!